Prior to writing my letter, I took the time to look up the state regulations for all 50 states. I found that only one state (sorry Tennessee) flat out said, “No cloth diapers.” I found that two states, Virginia and Maine had the limitations that cloth diapers could be used but only if there is a reaction involved. Ten states had no reference in their regulations at all in regards to disposable/cloth diapers. The last 37 states all had procedures on how cloth diapers should be handled. 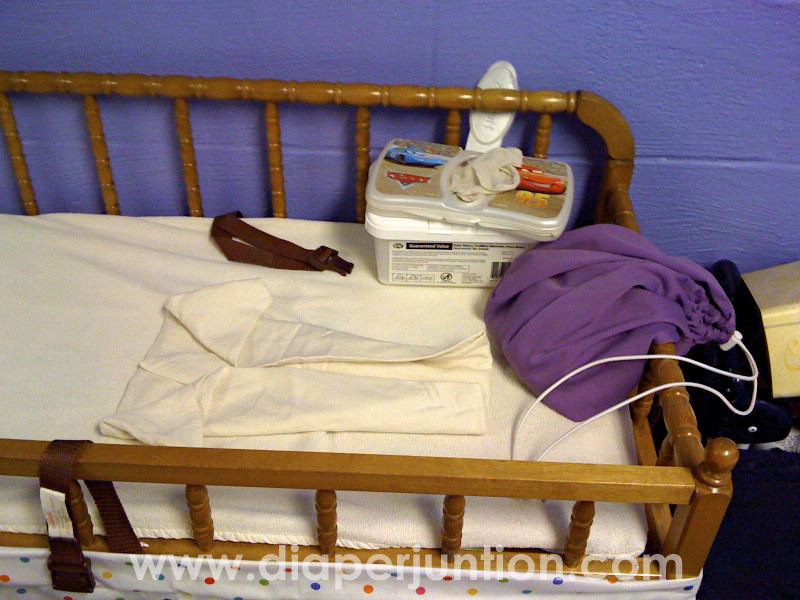 The procedures varied here and there but the bottom line was that the cloth diapers could be used. Parents shall provide a closable, waterproof container of some sort whether it is a waterproof wet bag that can be completely closed or a small diaper pail. This container should be taken home each day. Soiled diapers shall not be rinsed or washed by the daycare facility. Dirty diapers as they are shall be placed in the container “as is”. A waterproof cover must be used at all times and a clean diaper cover shall be used at every change. There were a few other technical recommendations that I made but that was the basic just of it. You and I know that it is just that easy, and I hope that the board realizes that as well. I pitched that modern cloth diapers are not unsanitary as previously believed, that cloth diapering not only saves the parents money but also saves the daycare facility as well as the state since there could be fewer disposable diapers to dispose of. I further explained to them that the cloth diaper industry is on the rise, it is creeping into the mainstream and that more and more new cloth diaper services are cropping up in the US. (We had 4 in Virginia alone open in the last year.) With their acceptance of cloth diapers, they could help our local economy by supporting these small businesses that sell and service cloth diapers. While writing this letter to our state I began thinking of this long list of 37 states that do actually have a cloth diaper procedure written in their regulation. I wondered if parents in these states have a hard time finding a daycare to take their cloth or is it not an issue? Does your daycare accept cloth diapers? Did you have a hard time finding one? What state are you in? Actually in VA I haven't had problems. I just said my son needed them and provided a separate step trash can. Indiana is a problem, though, because they only allow cloth if they are washed by a commercial facility. This is in MN statutes: "A. An adequate supply of clean diapers must be available for each child and stored in a clean place inaccessible to children. If cloth diapers are used, parents must provide a change of the outer plastic pants for each fecally soiled diaper change. Cloth diapers, except those supplied by a commercial diaper service, and plastic pants, if supplied by parents, must be labeled with the child's name." Seriously dated...plastic pants? our daycare in italy is fine with using cloth diapers. they even said the local authorities encourage daycares to use them, as this reduces the trash for the city. ... If any of you have the time to educate more daycares, that would help SO much! Thanks. OOPS- Cut off! (c) Caregivers shall handle cloth diapers furnished by the center as follows: (1) Waterproof diaper covers must be provided. (2) Caregivers shall use a fresh, clean diaper cover with each diaper change. (3) Caregivers shall keep the diapers and diaper covers in tightly covered containers between pick-ups. (4) A commercial laundry service shall launder the diapers and the diaper covers. reactions). The child’s health care provider must document the medical reason. The documentation must be placed in the Child Care Facility’s file. If these comments are limited by a number of characters, it would be nice for the box to reflect that. . . Thanks! I'll circulate that document to our San Diego Real Diaper Circle and the daycares in my community. Guess I had a long comment... and to provide a zippered wet bag large enought to hold all of the day's diapers. Again, the care giver simply folds the soiled diaper and snaps it shut and I do all the 'work' when I get home. I really hope that Jennifer of CottonBabies DIAPER Act legislation gets enacted. And if anyone has any questions about the military regulations, please feel free to call me 706-575-1548. Even if the state has procedures, the daycare has a right to refuse. Here in the Virginia Beach area, many and most daycares say no even if you provide a doctor's note stating that cloth is necessary. I live in AZ and graduate next week and am looking for a job and day care this summer. All the places I have looked at wont let us use cloth diapers. There is a new organic day care that just opened that I would like to use but it's an extra 40 dollars a week for tuition. It's so hard but I'm still looking, thanks for the 3 points to bring up. Next time I'll bring some cloth diapers and wet bags and show them how easy it is and they don't have to rinse anything, I'll do that! SC is one that makes no mention of Cloth Diapers. I have a friend who's daycare will not even entertain the thought. He only goes part-time so it is really only 2 diapers a day, so she didn't fight it. I asked at the preschool where my son will start in the fall and they seemed fine with it. So I guess SC leaves it up to the individual daycare facilities. For the lady that mentioned the NAEYC standards...I looked at the document you posted the link to. There is now a second line to that Standard that says cloth diapers are permitted if (b) and (c) are followed, which is basically the same procedures for soiled clothing. Placing the diaper in a sealed bag and sending home the same day. My daycare is in Virginia Beach and I am having a problem with it. Even with a doctors note they are hiding behind "liscensing issues". From what I've read if their liscenced then it's completely ok just pay attention on how you "dispose" of them. Bryana if you could provide the link you were looking at for here in VA then I'd appreciate it. I would like to double check and make sure what I was looking at was correct. Gotta get my ducks in a row!!!! Thanks!!! Could someone tell me what the TN regulation says and where I can find it. I am actually a physician who cloth diapers my child and am furious that the daycare won't allow cloth. Any help would be appreciated! I'm also in TN and haven't had any luck finding a decent daycare that will cloth diaper. I think it's really sad that TN is the only state that says "no cloth diapers". Actually, It is fine in TN. It just doesn't specify. I do it, and have won twice because of this. DHS says NOTHING about not using them, and it's not against state law. Just daycares will try to say that, and when you ask them where they say "Oh, I guess I was mistaken". Also, if you ask your physician to recommend that cloth dipes be used, they will never argue it. Interesting. I would have never occurred to me that there were state rules regarding diapering. I live in Virginia Beach and my daycare is being just plain lazy and discouraging me from cloth diapering. First off they said no unless I have a docs note. Then I got a docs note, they are charging me $5 extra to cloth diaper. I am ready to provide a pail with a wet bag, all AIO cloth diapers. All they have to do is put it in that bag as is for me. How difficult can it be. I would hate to switch to disposables or pay that $5 more per week just to CD. Any suggestions ? I need help! I work at a daycare in NYS and I know the regulations on cloth diapering. My daycare has decided it's 'not sanitary' to keep the diapers in the classroom in a bag in my sons closed cubby (which would follow the state regulations) and will not let me use cloth diapers. I really don't care to afford disposables nor can I afford other child care as I get a discount where I work. Any suggestions? Yes many state regulations don't allow to use cloth diapers and some that do, don't have anything specific . they make it sound so complicated that it scares the day care workers who plain discourage parents from using them. I feel we should all get together and sign a petition to change state laws so that they make it easier to use cloth diapers. In preparation to have the cloth diaper discussion with daycare centers during our daycare search, I gound New York State's regulations for cloth diapers in daycare... (o) The provider must use disposable diapers or arrange with the parent(s) or a commercial diaper service to provide an adequate supply of cloth diapers. (1) When disposable diapers are used, soiled diapers must be disposed of immediately into an outside trash disposal, or placed in a tightly covered plastic-lined trash can in an area inaccessible to children until outdoor disposal is possible. (2) Non-disposable diapers must not be laundered in the small day care center, and must be stored in a securely covered receptacle until returned to the diaper service. When parents provide nondisposable diapers, soiled diapers must be placed in a securely tied plastic bag and returned to the parent at the end of the day.